The Berry Season at Bramberi Farm is long and rewarding, from the first flower of the Blueberry in April to the last fruit of the Raspberry in November. 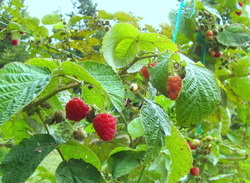 We are growing many varieties of berries to evaluate which have the best flavor and fruit characteristics and which grow best under north Georgia conditions, including feedback from all of you as to which varieties and characteristics you prefer. Listed below are the varieties growing in 2016.